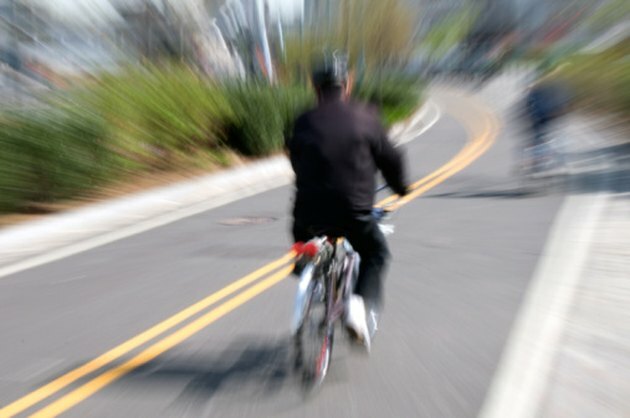 Bike riding speeds vary widely depending on your riding conditions. When you are zooming down a paved hill, your speed may increase to over 20 mph, while you may slow to only a few miles per hour when you are climbing a steep or rocky grade. Understanding what the average bike riding speed is may be useful if you are trying to train yourself to be an above average cyclist. In 2006, the city of St. Petersburg, Florida, installed bike riding lanes on two of its streets. During his study of the effects of the bicycle lane installation, senior research scientist William Hunter and his team found that the average speed of the bicycle riders was between 11 and 12 mph before the bike lanes were installed. The lanes were monitored periodically over a two-year period after their installation, and the researchers found that the average speed remained consistent. Cyclists commonly talk about cadence for measuring performance rather than the actual speed of the bicycle. Cadence is measured in the number of times your pedal rotates per minute. For the average rider, somewhere between 70 and 100 rpm is a good speed to maintain while riding. Your speed may vary throughout a ride as you go up or down hills, but your cadence should remain consistent because that means "you are putting out the greatest amount of power that you are able to sustain efficiently," according to bicycle mechanic Sheldon Brown. You maintain a consistent cadence throughout your ride by shifting the gears on your bicycle. If you shift into a high gear, there will be greater resistance on the pedal to slow your cadence down and make the pedal-to-wheel ratio closer to even. Lower gears place less resistance on the pedal so it turns faster. By shifting your gears appropriately, your legs will maintain the same average pace throughout your ride, regardless of how fast you are physically moving. According to charity cycling organization The Care Exchange, you must work on your technique, leg strength and endurance to build on your average riding speed. Count out your cadence for 15 seconds at your average riding pace and then multiply that number by four. Once you know your cadence, you can practice staying in the appropriate gear for your riding conditions and pedaling slightly harder to increase your cadence to somewhere around 90 or 100 rpms. Build your leg strength either through weight training or by practicing your hill climbing on an incline of 4 to 5 percent. You may also want to increase the amount of miles you ride weekly to build your leg endurance level. Having a high level of endurance is critical if you want to ride at a consistent speed over a sustained period of time.